HALIFAX -- Scientists have yet to find a cause for the massive fish kill off southwestern Nova Scotia, but one federal official said he doesn't think there is a reason to be concerned based on testing so far. Kent Smedbol, manager of population ecology for the Department of Fisheries and Oceans (DFO), said Friday that while the lack of an obvious cause is "perplexing," he doesn't personally believe there is need for concern at this point. "I can't speak for the department, personally at this point from most of the studies that have been undertaken, the evidence provided to date, I don't think there's a great cause for concern," Smedbol said in a news conference Friday. Since late November, thousands of dead herring have been found in a 100-kilometre swath from St. Marys Bay to Tusket, with most found between the mouth of the Sissiboo River and Plympton. More recently, scores of starfish, clams and lobster have also turned up dead, and a dead whale also washed ashore on a beach in Whale Cove. Smedbol said scientists conducted testing on the Bay of Fundy on Thursday and preliminary results for temperature, salinity and dissolved oxygen came back normal. A camera scan of the bottom of St. Marys Bay also showed normal conditions and an abundance of live lobster in the area. "That would indicate that the die off was unlikely due to an environmental event, because you would expect more broad-scale die offs across species particularly in the benthos, animals on the bottom," Smedbol said. "Things seem to be pretty normal on the bottom of St. Marys Bay." Derreck Parsons, a senior compliance program officer for DFO, said officers tracking and collecting samples of the dead herring have noticed a change. "It isn't appearing as if there's new observations of more dying or actively dying fish," said Parsons. "In all essence as far as we know it doesn't look like it (the fish die off) is increasing." Fish kills are not uncommon, especially in fresh water, but the last kills of comparable size involving herring occurred in the Bay of Fundy in 1976 and 1979, one official said Friday. Smedbol said that to date scientists have not turned up evidence of disease, parasites or toxins, and nothing has "stood out" in the physical examination of the fish and other marine life. He said DFO would be conducting further tests on recently collected invertebrate samples and was also willing to look for any connections by examining the carcass of the humpback whale, which he described as being in "a fairly advanced state of decomposition." "We have certainly worked through what I call the usual suspects and the fish health lab is working on a few more viral probes ... we will have to wait and see what happens over the next week," said Smedbol. He said a storm during the holiday period caused a sudden temperature drop to minus 5 degrees in shallower waters near Digby. The temperature dip and rough surf may have caused some creatures living on the bottom to die and wash up, Smedbol said, however he cautioned the examinations have turned up nothing conclusive. Alain Vezina, director of science for DFO, said he is in the process of contacting officials at the U.S. National Ocean and Atmospheric Administration and in the United Kingdom to seek potential help. Vezina said there was a fish kill in a Long Island canal in November, and one that killed several species of fish off Cornwall earlier in December. "So far as I can tell there doesn't appear to be any link between the various events," he said. "I'm mainly looking for more brains to throw hypotheses at us and see whether we can test more things here." 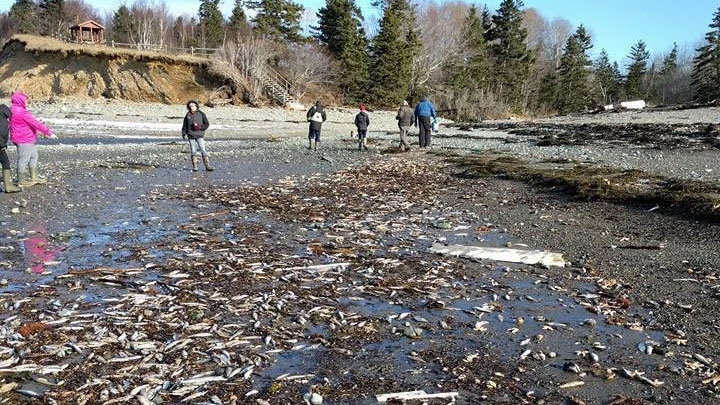 Thousands of fish wash up dead in southwestern N.S.